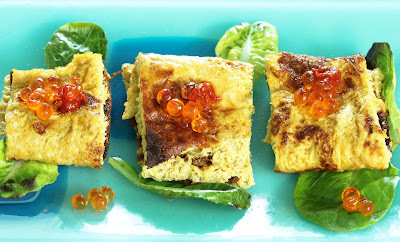 While similar to a seaweed-wrapped egg roll dish made by professional Japanese chefs, this recipe is both easier to make and tastes much fresher. 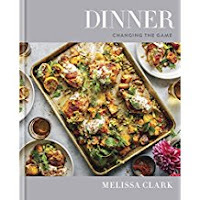 Melissa Clark captured the essence of Japanese tanaga* in her cookbook, Dinner-Changing the Game. 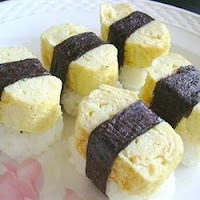 She modified the Japanese version to accommodate the tastes of her young daughter and for ease of preparation. Ready in about 15 minutes, she also describes this dish as Adult Comfort Food. I describe it as Perfection. I waited months in the library queue for this cookbook. There are so many promising recipes, I ordered a copy. I recommend you check it out, too - and Itadakimasu! 1. In a medium-size bowl, whisk together the eggs, sugar, tamarind, mirin and salt. 2. In a 10" frying pan, heat the sesame oil over medium heat. Add the egg mixture, and turn the heat down to medium-low. Cook the omelet just until the underside sets, them swirl the extra liquid around the edges to aid in cooking. When most of the liquid is set on the top of the omelet, flip it over and cook for 1 more minute, until fully set. Remove to a cutting board or serving plate. 3. Cut the omelet into 2" slices. Fold the strips into thirds after adding fillings and/or toppings. Makes about 1 to 2 servings. This size cooks well in the pan, and is easy to flip. To accommodate more people, double the recipe and increase the pan size to 12" or simply make it again in the 10" pan. Recipe adapted from Melissa Clark's "Japanese Omelet" here.